Stop using Post-its to remind yourself of important information. They’re just to easy to lose and they’re ugly when plastered all over your monitor. Instead, keep a little notebook on your desk to write down reminder notes. Liz Pulliam Weston has some tips for you to save your hard earned money. Why waste money on shiny packaging and a fancy store when you can find it online and 'pre-owned' for a fraction of the cost? Software and console games. Buy used, and you'll pay half or less what the software cost new. Console games like those for the Xbox and Sony PS2 that list for $50 new, for instance, can often be purchased used for $20 or less a year after release. Once you feel like your post is fully developed, start writing. Many times, I’ll start writing and realize that I don’t like the way the post is turning out. When this happens I just save the post as a draft, and let it marinate even longer. There are a couple of standards for ethernet wiring. They're generally the same, but they like to use different colors. Just make sure you use the same standard for each end of a cable and everything will be fine...Don't be afraid to get out your drill, but there's usually an easier to run your network wiring. It may seem daunting, but editing video has gotten much easier. Just look at the millions of homemade videos on websites, such as YouTube and MySpace. 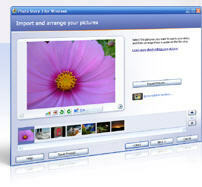 Apple iMovie, Microsoft Windows Movie Maker and Muvee AutoProducer even have tools to make "automatic movies" that take your clips and edit them for you. My personal favorite is Microsoft Photostory that converts your still pictures into a nice animated movie with pan, zoom and titles as you see on the National Discovery channel.